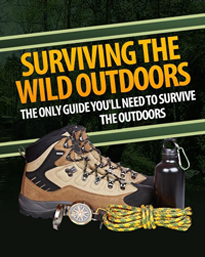 Apart from the firearm itself, the most important part of any hunting outfit is the telescopic sight and mounts. In years gone by, all rifles - both rimfire and centrefire - were factory manufactured with iron sights fitted, but now, mainly in the centrefires, iron sights are no longer supplied as a standard item. Perhaps this is because rifle scopes have become more reliable, more robust and less liable to let the hunter down in adverse conditions. If, however, the rifle is a centrefire that will be used for medium to long-range shots where accuracy is of the utmost importance, then the mounts that are fitted play a big role in the sure placement of the projectile. Mounts come in an array of types and models but surprisingly there are only a few firearm manufacturers who actually make scope mounts for their own rifles. 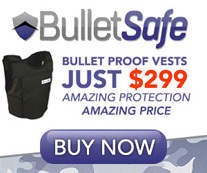 Sako, Brno and Ruger are companies that do. The others rely on scope and accessory makers to supply the mounts for the many other models on the market. When choosing the right scope mounts for your rifle, always obtain up-to-date information on the mounts that are currently available, while you may think there is no further room for progressio9n in scope mount design, companies continue to strive for quality scope mounts that will maintain accuracy, indefinately. 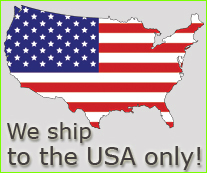 Worldwide there are literally dozens of manufacturers, with the majority based in the USA. 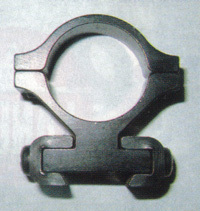 Some of the most popular scope mount manufacturers are Bushnell, Lyman, Redfield, Weaver and Williams. There are a few good mounts made in Europe, but they tend to be for the more exotic firearms - rarely used by the average hunter here. The European exception is Brno, a maker that has for many held an excellent reputation for its reliable .22 rimfire and .22 Hornet. Many rifle manufacturers factory drill and tap the top of the receiver to allow the mounts to be screwed on, but again, Sako, Brno and Ruger all machine their receivers and make mounts to suit - a system I think is far better. In my opinion Sako has the best mounts and mounting system of any manufacturer. It uses the two-mount system; the rear one has a stop notch at the rear to locate it in place and the front mount has a bevelled dovetail so that when the rifle is fired, and the scope and mounts tend to creep forward, the action tightens them onto the rifle. Further, the mounts are secured by bolts with large slotted heads, allowing the scope and mount to be taken off the rifle in one piece, without the use of any tools. Another bonus feature is that the scope and mounts can be quickly removed for safe transportation and later replaced without the rifle changing its zero. 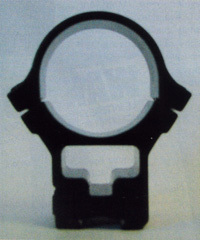 Telescopic sight bodies come in several sizes, but by far the most common is the one-inch diameter. All the major rifle scope manufacturers make models in this size. They are popular because of their superior light gathering ability. Scopes with a 30mm body diameter were first made by continental makers Zeiss, Kahles and Meopta and were quickly followed by Burris, Leupold and Bushnell from the USA and Nikon, Nightforce and Lynx from Japan. Now most mount manufacturers have taken up the challenge and more and more mounts are manufactured for this size scope. Some smaller diameter scopes are still made, so mounting rings for them can be bought, but certainly nowadays the standard is the one-inch type. Mounts come in many configurations, the simplest being the two-piece with dovetail clamps built into the bottom, like the Zero mounts mentioned before. These sit into the dovetail, machined into the receiver of the rifle and are tightened either with a screwdriver or Allen key, and then the scope fitted into the rings. Another type of mount has its bases machined to mate into the rifle's receiver top, like the Sako I spoke about in detail earlier. Ruger also use the two-mount system - both mounts having a slot protruding from the bottom, which mates into slots machined into the receiver. Like the Sako mounts, tightening nuts with large slots have been used and the scope can be removed using a coin. The mounts come in either blued metal or stainless steel and Ruger broke new ground including them within the price of the rifle, a really smart selling feature. As mentioned earlier, if the rifle has been manufactured with only screw holes in the receiver, then probably the most common mount fitted is the bridge-type, where a solid bridge is mounted across the top of the action and attached via screws into the pre-drilled holes. This means, of course, that the mount has to be made for that specific model of rifle. Weaver is one manufacturer who makes bridges with machined in dovetails to suit most rifles. They are fitted with a set of Weaver universal rings, which lock into grooves in the top of the dovetail so they can't move forward. They also have large slotted bolt heads (like the Sako) so the scope can be removed without tools. Many other makes of bridge mounts are available, some with rings that have the ability to be moved laterally, so the scope system can be adjusted should the mount not be correctly aligned with the bore of the barrel. Another type of mount is attached via screws to the side of the action. 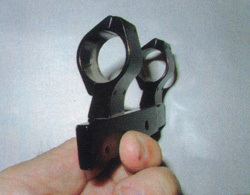 These side mounted ones have usually been designed for a particular purpose, such as to overcome the top ejection problems found with some of the Winchester, Rossi and Browning top ejection lever actioned rifles, or when hunters want to use their primary iron sights, like the Savage Model 340. Some of these side mounts can be installed by the 'do-it-yourselfer' who doesn't want to drill holes into a pet rifle - as they have been designed to be screwed into existing holes or clamp on without drilling and tapping. Because no built-in mounting system is available, a lot of our own SMLE .303s and their offshoots have been fitted with various makes of mounts, like the Australian-designed Field Mounts, which have given many years of good reliable service in the field. A derivative of this mount is where the mount itself tips or rolls off, usually to the left, so as not to interfere with the rifle's bolt. 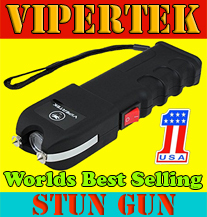 This allows the iron sights to be used for close shots in thick scrub or in an emergency where the scope has been damaged or found to be unreliable. Yet another configuration has the rings extended high above the bore with a hole drilled through the mount, allowing the iron sights to be seen under the scope, like the Sako ones pictured, or with the so-called see-through mounts, where the rings are very high with a see-through section underneath. When buying a new set of mounts for any of my rifles there are a few basic features I always look for. Firstly, I like to be able to remove the mounts without tools - either using my fingers or a small coin. 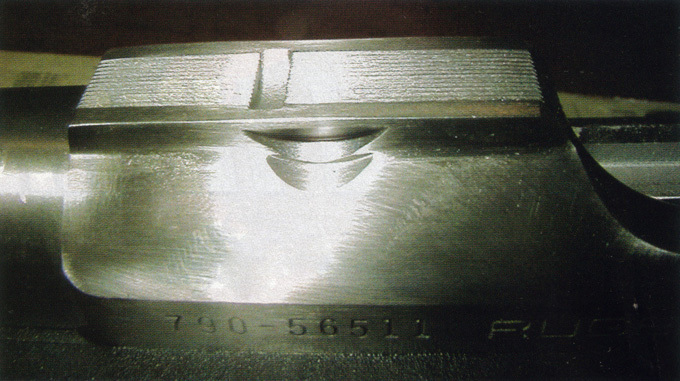 This means that the tightening bolts must have large heads and large screw slots machined in them. Next, I prefer the rings that hold the scope in place to have two screws either side, for a stronger and more even grip. I prefer the screw heads to be slotted rather than having Allen key holes. I always remember when I was caught out on a hunt many years ago and needed to remove the screws. I didn't have an Allen key with me and I swore it wouldn't happen again. One could say it was poor planning not to have a set of Allen keys with me, but we all tend to forget things and a small screwdriver always seems much easier to scrounge than the right-sized Allen key. Finally, I also prefer mounts that can be adjusted for windage, as sometimes, for a number of reasons, the scope doesn't line up with the rifle's bore and the scope needs to be moved laterally to get the shots on the target. While this is not a major problem with most scopes, I have found it to be problematic when using high magnification ones, where the field of view is quite narrow. If the mounts don't have windage adjustments, it becomes a major problem that is best avoided.